It is no secret that Toyota leads the automotive industry in continual safety innovation. 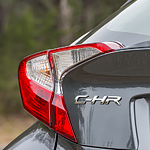 The new C-HR continues this tradition of commitment to safety and security all along the roads of Plano, TX. This popular subcompact SUV boasts a host of safety features all designed to give you the confidence that you need to tackle any driving or road condition. The integrated backup camera projects an image on to the standard 8-inch screen, giving you the perfect view of everything behind you. This feature makes backing out of even the trickiest spots a breeze to handle. With ten standard airbags, you will feel well-protected as you drive your new C-HR. In addition to the driver and passenger Advanced Airbag System, the C-HR also houses front and rear side curtain airbags, driver knee airbags, a front passenger seat cushion airbag, rear seat-mounted side airbags, and driver and front passenger seat-mounted side airbags.